1. Preheat the oven to 160°C, gas mark 3. Place the raisins, bourbon and maple syrup in a small saucepan over high heat and bring to a simmer. Cook for 12 minutes or until the mixture is thick and glossy. Set aside to cool slightly. Line 2 large baking trays with non-stick baking paper. 2. Place the butter and both the sugars in the bowl of an electric mixer and beat on medium speed for 6-8 minutes or until sandy in texture. Add the egg, extra yolk and vanilla, increase the speed to high and beat for 2 minutes or until pale and creamy. 3. Place the baking powder, bicarbonate of soda and water in a small bowl and mix to combine. Add the baking powder mixture, the flour and salt to the butter mixture and beat on low speed until combined. Add the granola and the raisin mixture and beat until just combined. 4. Working in batches, shape 60ml (4 tbsp) portions* of the dough into balls and place on the trays, allowing room to spread. 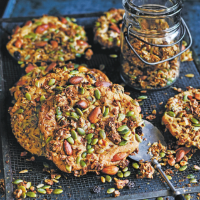 Top with extra granola and bake for 20 minutes or until golden brown and firm to the touch. Allow to cool on the trays for 10 minutes before transferring onto wire racks to cool completely. Repeat with the remaining dough to make a total of 15 cookies. *TipTo make regular-sized cookies, shape 2 tbsp portions of the dough into balls. Place on trays with room to spread and bake for 14-16 minutes. This recipe was first published in Thu Nov 01 14:29:56 GMT 2018.